If you have read this blog over the past two years you know my interest in Bible translations and the theory behind each. One of the major debates/controversies in Bible translation is the approach taken, usually divided into two sides: formal equivalence (“word-for-word”) and functional equivalence or dynamic equivalence (“thought-for-thought”). From the rhetoric, it would appear as if any who uses the “other” method/approach is no longer faithful to God’s Word. Brunn, Dave. 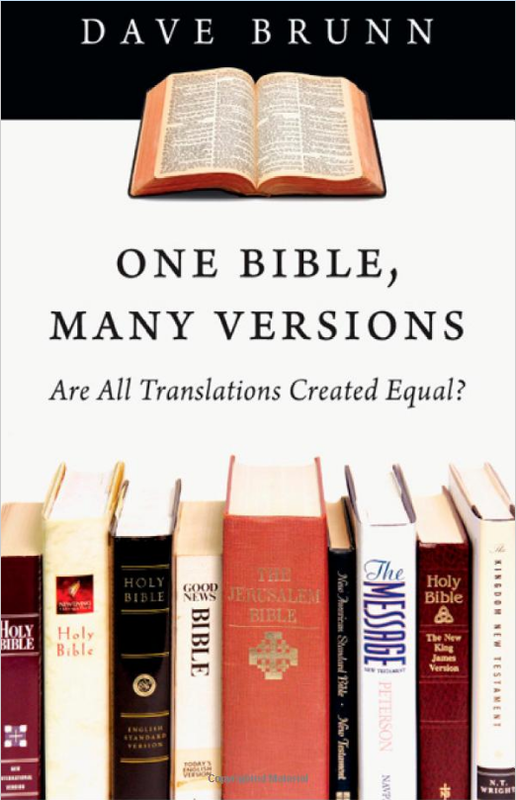 One Bible, Many Versions: Are All Translations Created Equal? IVP Academic, 2013. This is not strictly an academic book, rather it is the result of the work of a missionary translator from 1980–2001. He translated the Bible into the language of the Lamogai people in Papua New Guinea. Thus, his experience directly and practically relates to finding the best way to communicate the truths of Scripture in the language of the people. I also like the fact that he uses appropriate visual tools! He quickly shows that even “word-for-word” translations use “thought-for-thought” principles. He presents a table that is five pages long, with examples of two translations (NKJV and ESV) that are on the “word-for-word” side of translations. But then in the final column he provides the NASB, considered the most “literal” of all English translations, which in every case provides a “thought-for-thought” translation of the same passage. Further, he provides evidence of three other translations, NIV, NLT, and GW, which are considered firmly in the “thought-for-thought” realm, but give essentially literal renderings while NASB, ESV, and HCSB give “thought-for-thought” translations in the same passages. While I have only read the first 40 pages, I appreciate what he sets out to do, his approach, and his insights. His reasoned voice is necessary. I look forward to reading and studying the rest of the book. Several years ago I began teaching about translations. I made the statement that we cannot set up one English translation by which to judge all other English translations. Rather, we have to always go back to the original language texts (Hebrew, Aramaic, Greek). Thus, we can look at the English translations as aids in helping us understand what the underlying text is saying/meaning. Do each of us have our favorite translations? I would expect so. I grew up with KJV, then for the past 36 years have used NASB, and also served in the testing of GW translation from 1987 to 1995. But I am not absolutely glued to those translations. I live in an area which is 98% unchurched; thus, the use of a translation is critical because we can be precise, yet not communicate with people at their level. I enjoy reading what you teach. I too grew up with the KJV, and still love it for it’s “poetic feel”, especially reading out loud the O.T. I have been using the NIV Study Bible 10th anniversary edition for basic study because of the extensive foot notes, which I often cross check with other sources. I have other versions as well and a usable reference library. But, what ever Bible version I use, my first rule for study is: Within my understanding,(always a limiting factor) what is God telling me in a particular verse or passage as it relates to the totality of the message? What does He want me to understand? And, how does that relate to Luther’s “First Thing”? Pretty much, how does a passage point to the cross. After all: Crux Sola est nostra theologia. John M.
Next Next post: Is “acknowledge” enough?